Leslie Controls manufactures steam valves, water pressure valves and regulators and has for more than 100 years, proudly equipping United States Navy ships during World War I and World War II. As the product line grew through the decades, the company expanded considerably, but the core business remained, providing the basis for the most diverse and innovative control valves in the world. Unfortunately for the company and its employees, Leslie’s pumps, gaskets, pipe parts and steam valves all were manufactured using asbestos, a naturally occurring mineral that causes a variety of health issues for those exposed to it. Asbestos once was so valued for its ability to control heat and to insulate. It was not only strong, versatile and available but also toxic, which became well known by the early 1970s. A 2015 British Medical Journal article reported rates of asbestos-related deaths in Belgium between 2001 and 2009. According to the research, people who worked in metal-products manufacturing have an 87 percent higher risk of dying of mesothelioma than the general population. John Leslie of Canada started the company in 1905, and the first product he advertised was a steam-powered snowplow for railroad locomotives. His first manufacturing plant was in Lyndhurst, New Jersey, where it began serving a variety of utility and industrial customers. Leslie is now based in Tampa, Florida, where it operates a 150,000-square-foot facility. Leslie was purchased in 1990 by Watt Industries, one of the largest independent valve manufacturers in the world. It provided a more global marketplace for the Leslie fluid control products. Today, it is a subsidiary of CIRCOR. 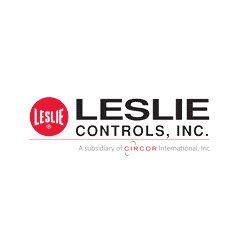 With more than 100 manufacturers nationwide, Leslie serves oil and gas, petrochemical, power generation, commercial marine and military marine markets everywhere. Exposed to Asbestos at Leslie Controls, Inc.? The widespread use of asbestos — and the devastation it caused — led to thousands of lawsuits against Leslie from both those who worked directly for the company in manufacturing and from those who worked with the products it sold. Leslie filed for Chapter 11 bankruptcy in 2010, citing as the primary reason the 1,307 asbestos personal injury claims that were pending at the time. According to court papers, a majority of those claims stemmed from the use of asbestos on U.S. Navy ships from 1940 through the 1980s. That exposure led to development of asbestos lung cancer and mesothelioma. As part of the asbestos bankruptcy reorganization plan, a Leslie Asbestos Trust was established in 2011 with an estimated $75 million from Leslie and proceeds from existing insurance companies. The trust was created to process, liquidate and pay future claims in accordance with the Distribution Procedures approved by the U.S. District Court for the District of Delaware, allowing Leslie to emerge from bankruptcy protection. Claims are being accepted until Sept. 1, 2012, as part of the Initial Claim Filing. Before bankruptcy filing, Leslie had met with mixed results in various liability cases. In one, for example, Merrill v. Leslie Controls, Inc., a U.S. Navy veteran won a $1.218 million award against Leslie stemming from his 20 years of service aboard four different vessels, where he worked with various gaskets and valves produced by Leslie. But two years after the award, a district court of appeals reversed the original ruling because the veteran had not satisfied the burden of linking the asbestos product with the packing and gaskets that he had been using. Although veterans are prohibited from bringing liability claims directly against the U.S. military, which is protected by sovereign immunity and the Feres Doctrine, they can file claims against companies like Leslie, which provided the Navy with the toxic products. The inhalation of asbestos fibers is the primary cause of a number of respiratory illnesses, including mesothelioma, the cancer with a latency period that can be up to 50 years from time of exposure. Many men and women who served in the Navy aboard ships could have been exposed to Leslie asbestos products because of the close quarters. Most vulnerable were those involved in ship maintenance, and anyone working in the engine, boiler or pump rooms. Where there were valves involved, there likely were Leslie products. Anyone involved in the maintenance of water plants, power plants, chemical plants, oil or gas refineries, may have been exposed to Leslie products.